YES Staffing Employees are the Best Professionals in Utah! For our June employee spotlight we'd like to shout out to someone who deserves to be recognized far more often than he is. 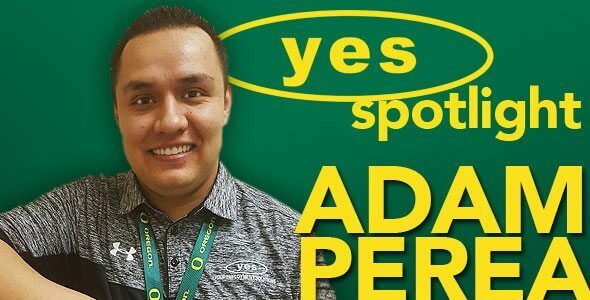 Adam Perea! Adam works as our swing shift on-site manager at one of our largest clients in Ogden. He doesn't work the typical 8-5, which makes it hard for our offices to recognize his work sometimes, but Adam is an extremely valuable asset to our team. He is dedicated, reliable, hard working, friendly, funny, and such a great team player. Support from management. Being on the night shift I know they are a phone call away with any issues I run in to. To continue what YES does. I witnessed the Fresenius account start up from the beginning to where we are at now and to see how far we have gone in just shy of a year shows what kind of a company YES is and how much they value their customers. Jonathan Davis from the band Korn. The mountains with some good trails. 7. If you had to choose between the Ducks winning a national title or selling your RZR, which would you choose? Being forgetful at finishing tasks. There is a lot that goes on at Fresenius that you forget to complete those tasks when being added other tasks, it can get crazy. Take notes of the tasks and go back and make sure they get completed then cross them off after they are completed. They will be well taken care of and they will see how much different YES is compared to other agencies and to come in and find out for themselves. 11. You're a fan of Metallica and other classic metal bands. Who would make a better headbanger? The president of YES Reed Laws or YES' CFO Kerry Westenskow? Why? Reed because team Fresenius was in a proposal meeting with Reed and Jarum and Reed was looking on the calendar and he saw that I was off for the Def Leppard concert and he started singing “Pour Some Sugar On Me” by Def Leppard in front of us. It was pretty funny! Thank you Adam for all that you do, you're amazing!